With an invitation extended to China from the White House for renewed trade discussions has laid the grounding for renewed positivity in market risk appetite. This comes as US inflation signals have dropped off the boil in recent days, helping to drag the dollar back, but also to renew the upside pull on equities again. Better risk appetite means a move out of safe havens such as the Japanese yen (and to an extent gold) but the beneficiaries of this come with the support for the Chinese yuan and commodity currencies such as the Australian dollar. The week ends today with US retail sales and it will be interesting to see whether this slip in inflation is reflected in consumer spending too. If so this would play in to the recent weakening of the dollar. Mario Draghi painted a fairly upbeat picture of the Eurozone economy and has underpinned support for the euro (thus adding to sentiment against the dollar). Steady as she goes seems to be the line from the ECB for now. Back on trade, the caveat is that the weekend is approaching and Donald Trump has been relatively restrained from antagonising tensions for a while. This has helped to stabilise emerging markets and helped risk appetite. However, history tells us that restraint from Trump tend to be short-lived. Wall Street closed decisively higher again with the S&P 500 +0.5% at 2904 with futures ticking further higher today. This has helped strength in Asian markets with the Nikkei +1.2% (helped by yen weakness). European markets are mildly positive in early moves today. In forex, the market continues with recent trends as the dollar is slipping a touch across the majors aside from against the yen. In commodities we see gold pulling back higher again, seemingly as the trend of dollar weakness is helping to lift gold price on the negative correlation once more. Oil has also started to find a degree of support after the sharp unwind yesterday, however, near term prospects are likely to be linked to the progress of Hurricane Florence. There is a main focus stateside for traders in the today, starting with the US Retail Sales at 1330BST which is expected to show core data (ex-autos) improved by +0.5% for the month of August (+0.6% in July). There will also be consideration given to the US Industrial Production at 1415BST which is expected to grow by +0.3% in August (+0.1% in July), with Capacity Utilization improving further to 78.2% (from 78.1% in July). The prelim reading of the University of Michigan Sentiment is at 1500BST and is expected to have improved to 96.6 this month (from an upwardly revised 96.2 in August). Aside from the data, European traders (specifically of UK assets) will be watching for comments from Bank of England Governor Mark Carney who is speaking in Dublin at 1100BST. The improvement in risk sentiment that has developed in recent days is shown perfectly in the chart of Aussie/Yen which is seen as the cross of a higher risk versus safe haven currency. Since bouncing from 78.7 earlier this week, the market has seen successively improving bullish candlesticks, however, it is the pull above key resistance levels at 79.70 and then 80.50 which is really encouraging. The improvement is now set to test the resistance of a two month downtrend now which comes in at 80.85 today. 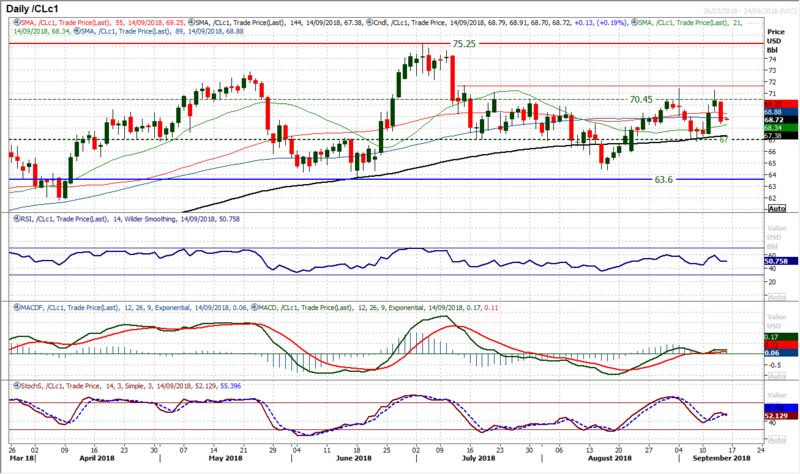 The rebound is backed by a confirmed bull cross buy signal on the Stochastics. However, also encouraging is that the MACD lines are also crossing higher below neutral for only the fifth time in six months, each of which has been the precursor to a significant rebound. A closing move above 80.50 which is the old floor of the five month trading range would be a sign of strength and if this is accompanied by a broken 2 month downtrend then the outlook would be far improved. A recovery to the 81.80 pivot would then be open. The hourly chart shows initial support in the band 79.70/80.20 and if the market begins to form support above here it would be a signal for a buy zone to kick in. A decisive bull candle from yesterday’s session has put a more positive complexion to the pair once more. The market had been drifting a shade higher throughout the week, but the ECB and US inflation combined to encourage euro bulls and a dollar correction to pull EUR/USD 60 pips higher and above the initial resistance at $1.1650. This has taken the pair to a two week high and into a position to potentially end a consolidation phase. 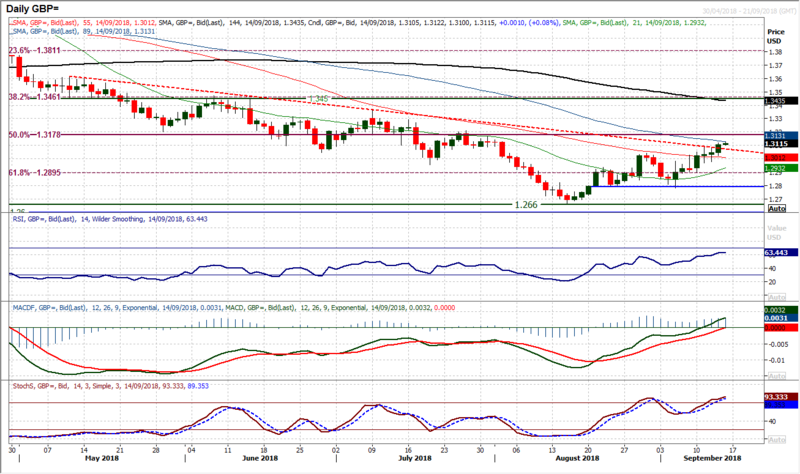 The move is now taking the market away from the converging 21, 55 and 89 day moving averages and is now set to test the key August high of $1.1735 and run of July resistance at $1.1745. This is the key medium term test. The market comes into it with strengthening momentum, with the bull kiss on the MACD lines, Stochastics rising and RSI above 50. This suggests that intraday and near term corrections will be a chance to buy. The hourly chart shows the old resistance of the initial breakout at $1.1650 is now a basis new support, with a buy zone now $1.1600/$1.1650. 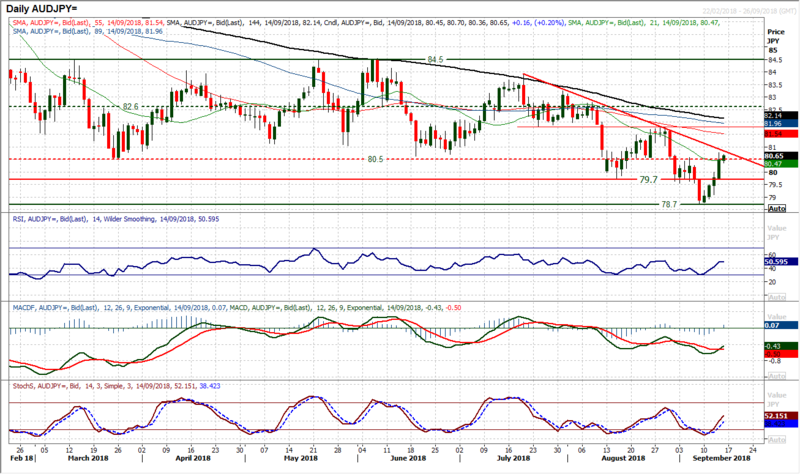 The Cable recovery continues, with another positive candle that has now broken a four month downtrend. 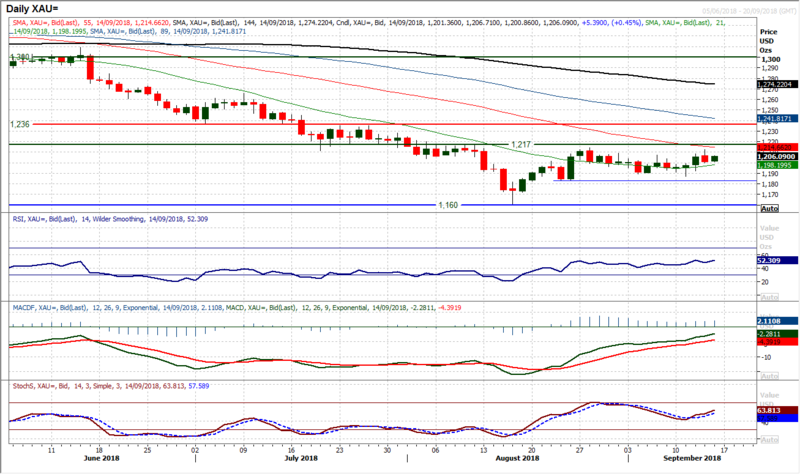 The market is now decisively above $1.3000 and is now having a look at the late July resistance $1.3170/$1.3215. Momentum is increasingly positively configured with the RSI rising into the mid-50s, the MACD lines accelerating above neutral and Stochastics strong. This suggests that intraday corrections are a chance to buy. This is reflected on the hourly chart with a strong trend in place, whilst support begins at $1.3085 making $1.3025/$1.3085 a near term “buy zone” now. Support is growing at $1.2900 and $1.2965. An improvement in risk saw traders moving out of the yen yesterday, and even though the dollar was under pressure across the majors, there managed to be a gain of nearly 70 pips on the day that is now testing the resistance band between 111.75/112.15. This continues the positive bias that is present on Dollar/Yen with the momentum indicators ticking higher. However there is still a reluctance to the momentum which suggests this is a tentative market and even if resistance were to be breached the market may struggle for sustained upside. Reaction to the early slip back today could be telling with 111.65//111.75 initially supportive. A breach could see the market back at 111.10. 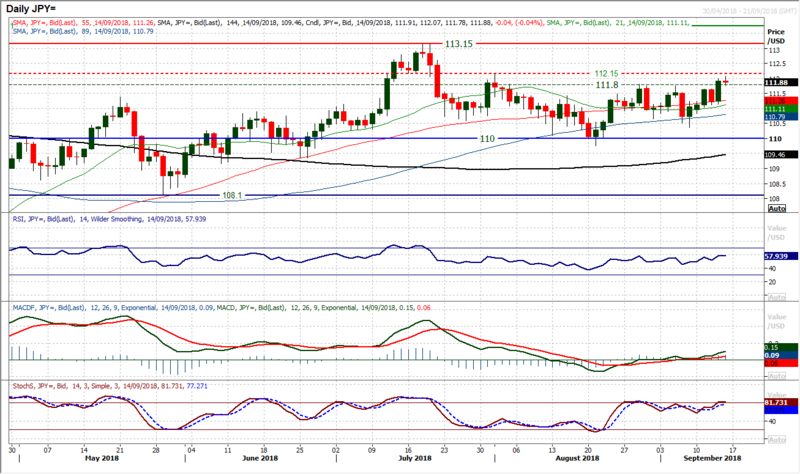 A close above 112.15 does re-open 113.15 but the lack of intent on the momentum is a concern for any bull move. The bulls are not having this move higher easy. Yesterday’s corrective candle seemed to initially have a breakout in mind, only for the move to be cut short and a negative candlestick form for the session. This makes today’s session all the more important as another bear candle would really question the strength of the move higher again. It is important for the bulls to continue to trade with a $1200 handle, a level which was held into the close last night and has held again early today. A close below $1200 would add to concerns for this recovery. Momentum indicators are tentative in their improvement but equally could quickly shift on a negative move in the market. The support at $1187 is ultimately key within this move. The hourly chart shows that the unwind to $1200 has been contained for now on momentum, but another swing lower today would likely shift the outlook. This is an important moment for the recovery. With the category strength of Hurricane Florence having been downgraded so we see the oil price retrace the previous sharp move higher. This was the fear that we had for the rally earlier in the week and is often the case on newsflow or natural disaster driven moves. 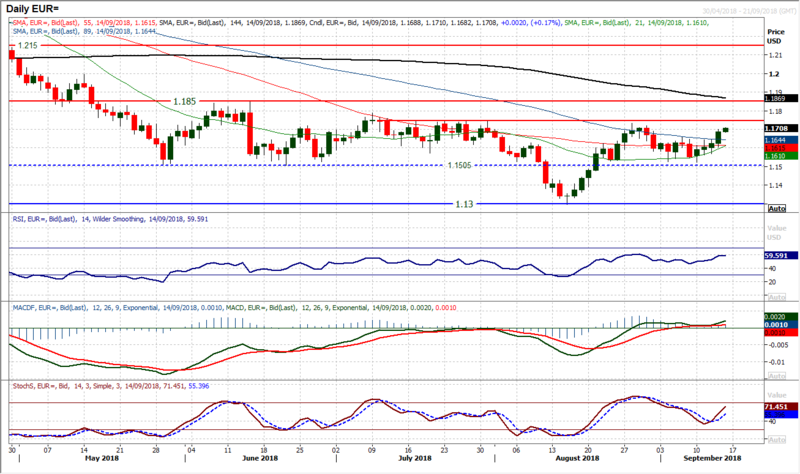 Subsequently the strong negative candle is retracing the gains and the pivot at $67.00 is once more a potential move. 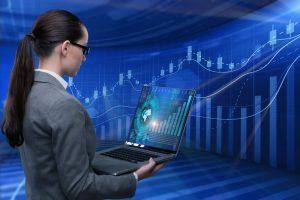 Momentum indicators are all over the place with such contradictory moves in recent days, so until the market settles down it is difficult to get the overall outlook. How the market responds to the pivot at $67.00 will be key though. Yesterday’s $68.35 low seems to have marked a degree of initial support and it will be interesting to see how the market deals with yesterday’s drop. Initial resistance is now $69.50/$69.75 and a move back above would be positive once more. The resistance at $70.45/$71.40 has been bolstered by the moves this week, and a close below $67.00 would open the $63.60/$64..45 support band again. Although there was the briefest intraday move above 26,168 yesterday, the breakout could not quite be confirmed. However, there seems to be a renewed sense of positivity in the market in the last few sessions and a breakout to multi-month highs should only be a matter of time. Using the support of the 76.4% Fibonacci retracement seems to have been a basis of the renewed positivity and momentum indicators are ticking notably higher again. The Stochastics are especially encouraging with a bull cross giving upside potential. A close above 26,168 would open the all-time highs at 26,616. 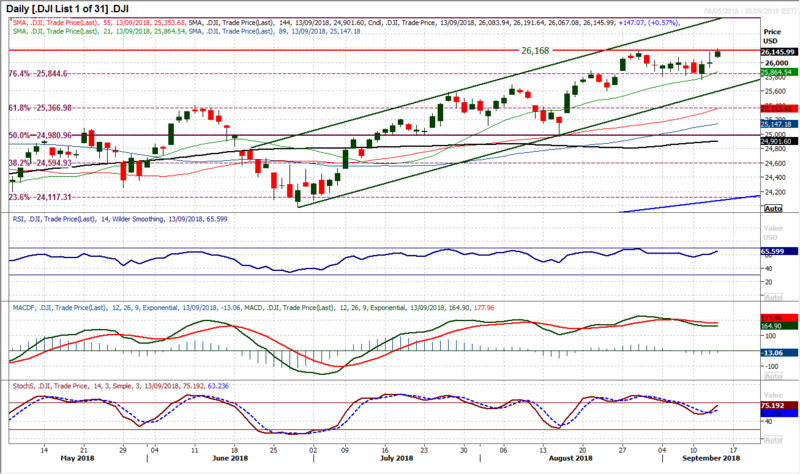 The near to medium term importance of the 76.4% Fib at 25,845 and the reaction low at 25,754 this week are growing. Corrections are increasingly a chance to buy again.